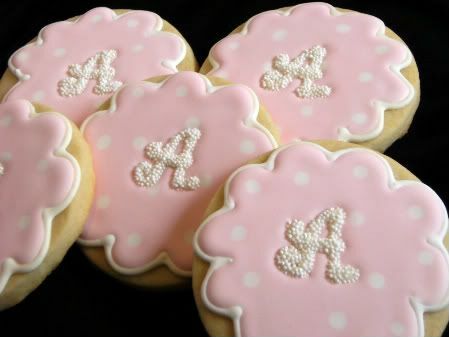 I was so excited to get to make these dotty monogram cookies again...this time with an A monogram. They are going to be for a baby shower. I hope the mommy-to-be likes them!!! For instructions on how to make the dotty monograms, click here. For more on making flat dots in icing, click here. I am so doing those for an upcoming shower I have. Where do you purchase your non-pariels or whatever they are called? Ooh, I love these! The monogram looks hard! Those are gorgeous!! You are so talented. The new mommy is going to LOVE them! Pretty! I good tip on the buttermilk. These are A-dorable! Love the non-pareils on the monograms... have to try that sometime :) Have a nice day, Bridget! I don't remember seeing those! They're lovely! I like how you did the initial. These are fabulous! Off to go read the tutorials! Those are precious! They look so pink and dainty. The monogram looks awesome. These are so cute..I read your instructions and it seems doable..at least in theory. Thanks for all the great tips! How do you assemble these? 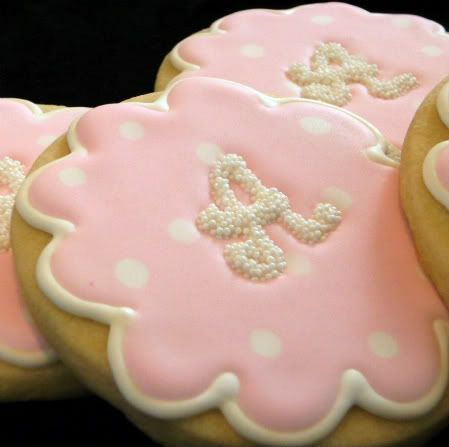 Do you put the monogram on first and then flood the cookie or do you flood the cookie and then add the monogram? 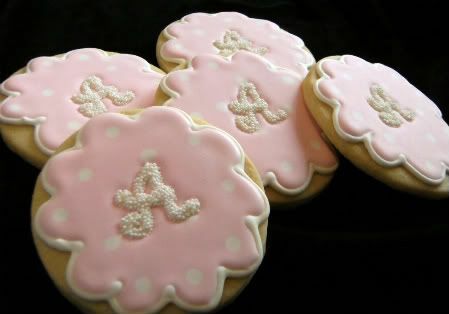 I'm thinking about doing a cookie with a monogram for my daughter's wedding. Hi Kim...outline, then flood your cookie first. While the flood icing is still wet, carefully add your pre-made monogram.